Chain Mesh Slats : Fencing & Screening products, cyclone wire slats, Chain link Slats, wholesale cyclone wire slats, Polyethylene, diamond link fence security, privacy slats, NT deemed to comply, fake hedge, fence inserts. Scenic Products specialise in the importation and marketing of PDS® Fence Products, manufactured by Pexco Extrusions Inc., the Chain Link Enhancement Product line greatly improves the flexibility and functionality of chainmesh fencing. • Winged Slats® includes Ethyl Vinyl Acetate (EVA), a softer plastic to keep the wings flexible and resilient. • Hedge Link™ is made with 16-gauge, galvanised, braided wire and needles are made with 3-mil (PVC). PDS® HDPE & PVC Fence Products are resistant to: severe weather conditions, salt water, sand, road dirt, most acids, alcohol, alkaline, ammonia, petroleum distillates and common environmental pollutants. PDS® Fence Products carry a 25-year, pro-rata warranty against breakage under normal conditions. Lite Link, Hedge Link and Missing Link carry a 10-year, pro-rata warranty. Contact Scenic Products for further details. 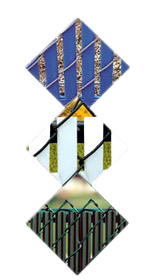 Scenic Products has developed proprietary CHAINMESH BASED FENCING systems approved for category C regions. Satisfies Northern Territory Deemed to Comply fencing standards. Fitted with our products your chain mesh fence can be climb proof and provide privacy. • SECURITY - Chain link fencing becomes impossible to climb after installation of the slats, keeping children in and potential thieves out. • ATTRACTIVE - Chain mesh slats are pleasing to the eye in design and colour, they greatly enhance the look of any chain mesh fence. • ECONOMICAL - Per square metre PDS® chain mesh slat fencing works out to be a very economical investment compared to other fencing alternatives. • INSTALLATION - fast and uncomplicated to install. Roadside screening, climb proof / vision control fencing for schools, kindergartens, carparks, tennis courts, landscaping backdrops, screening of utilty stations, railway lines & airport fencing. Top Lock and Bottom Lock have been approved by DHS (Vic) as complying with AS1926 and are deemed to make 50mm chainmesh Non-Scalable. See DHS Letter. Scenic Products - wholesale distribution of a world class range of wire mesh fencing products for every possible situation. We also supply 'Instant Hedge' style fencing, Christmas hedge fencing, fake hedge fencing slats.